I have been a bit quiet which doesn't help keep the forum alive. I play drums, most regularly in church, and today was one of those great days when I had the time to spare and so I spent all morning replacing the electronic toms on my church kit with my acoustic toms and some new heads I bought for them. I am having to learn to play soft like a jazz drummer, otherwise I will be louder than anything and everything else! So, that's me. What about you; what have you been doing to keep yourself busy? Unfortunately a family member is having to have an extended stay in hospital, a side effect of which has been a lot of my spare time has been soaked up. But I have my ongoing strat guitar build - that has helped keep me sane in a way! I will need to update the thread soon, as I've done quite a bit in the last 3 days. Also the gigs continue off and on, as ever. This morning I'm heading off to play at a primary school - they asked an ex-pupil who is studying jazz trumpet at Leeds College of Music to play, and he asked me and a few other local musos if we could accompany him. Not sure what the actual event is, but it should be fun. Light touch on those drums! Brushes even! Flask of tea. How very rock 'n' roll ! 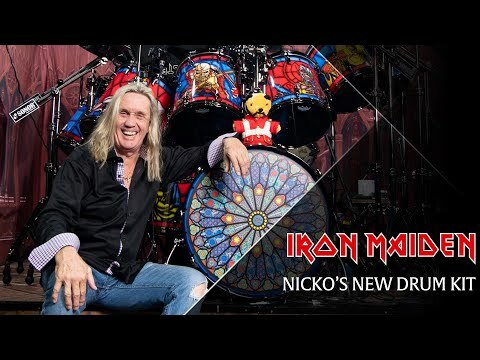 It seems I am in good company: see what Nicko, Iron Maiden's drummer has on the left hand side of his kit at precisely 10 seconds into the video! I started a new job about 5 months ago which is leaving me exhausted when I come home, so if I can grab a few spare mins I’m practising or maybe doing a little soldering of something - swapping a pickup, fixing a switch, that sort of thing. I did recently finish building two pedal boards though. They are to make it easier for me to move and or setup my looping rig. I have a big birthday coming up so want to practise for my planned birthday open mic/party. Not so much that I've been doing things to keep me busy, just that life throws things at me to keep me away from things I enjoy. Trying to sell the house and that has been taking up a lot of time this last few months including getting a fair chunk of remedial work done. A lot of time seems needed to chase people and organisations up on what they should be doing without being chased. It is turning into a long drawn out process too - maybe the many new builds going up around here are not helping our sale prospects. Lot's of positive comments and nice things said but no takers! As the house move is an integral part of my retirement planning it's very frustrating that it's not happened. We had youngest son's long term girlfriends Mum passing away unexpectedly a couple of days before his graduation so the graduation ceremony didn't happen. Hopefully he does well at his masters this coming year and gets another chance to graduate. Hope your family members OK Graham ... sorry if you've mentioned anything of that elsewhere as I've not got to it yet. We had our youngest dog bitten by an adder, and thankfully after emergency care and time he seems recovered - that was frightening. Reduction in staff numbers at work have meant more work shared between the rest of us, and arriving home even more knackered. I know what you mean about the state in which you get home Nick - my sympathy to you. Due to the house move thing a lot of my instruments are in storage. It's worrying that I haven't really missed them. Hmmmm ... could it mean I don't need them? I have had a couple of musical things going on - a loan guitar on a "road trip" and a video course. I'll maybe get around to posting something on those.